Suspenders are a traditional accessoiry. They were mainly worn by workers and children. Later they were even as an accessory for masculinity. Today suspenders aren´t that much trendy anymore. But they are very practical, especially for chubby men. You get a high wearing comfort and a convenient feeling. You can also wear a belt, but often belts can´t keep the trousers on your waist. We recommend wearing suspenders, so you don´t have to think about the right position of your trousers. 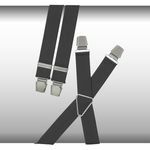 BigBasics offers overszied suspenders to give you a convenient feeling while wearing your trousers. They have to comply different criterias. They should have larger clips, wider and longer supporter which crossed in the back. You can order XXL suspenders in classic colours like blue, marine and black. You can combine them also with sporty jeans or shorts.